Daily Illuminator: Our Third Thaumatology Installment Is A Hat Trick! May 29, 2012: Our Third Thaumatology Installment Is A Hat Trick! In incalculable corners of the cosmos, magic makes the world go round. From little tweaks to major overhauls, putting a different spin on all matters arcane is a surefire way to add a spark to the gaming table. 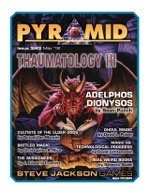 It's in this spirit of enchanting innovation that we summon Pyramid #3/43: Thaumatology III. This issue has more magical might per square inch than a wizard's robe! It includes a new GURPS Thaumatology: Magical Style school presented by Sean Punch, crazed cultists for GURPS Dungeon Fantasy, an alchemical expansion of the magic rules from GURPS Monster Hunters, a terrifying tome of GURPS Thuamatology rituals from David Pulver, and much more! Whether you're shaking magic to its foundations, slaking the hungers of vintners and ghouls, or waking a world that's forgotten how to believe, Pyramid #3/43: Thaumatology III has countless coneys crammed in its chapeau. Pick up this issue today, or summon a subscription and be amazed!